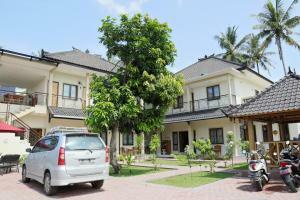 Located just a 5-minute drive to Senggigi city centre, Pondok Wayan offers simple and comfortable accommodation. Free WiFi access is available in all areas. Rooms are provided with a flat-screen TV, air conditioning and a terrace. Private bathroom also comes with a shower. Guests can approach the staff to arrange for car hire, airport transfer and laundry service at an additional fee. The property offers free parking. Other facilities offered at the property include a garden. Breakfast is served in the room and various dining options are available within a 10-minute drive from the property. Pondok Wayan is a 45-minute drive from Bangsal Harbour and a 1-hour drive from Lombok International Airport. When would you like to stay at Pondok Wayan ? This double room features air conditioning, flat-screen TV and terrace. En suite bathroom comes with a shower. Each day we'll check prices and send you an email for your selected dates at Pondok Wayan. If you don't have specific dates but would like to check prices for say next weekend or say next month we can check the price too. Click to write a review and share your experience of Pondok Wayan with other travellers.